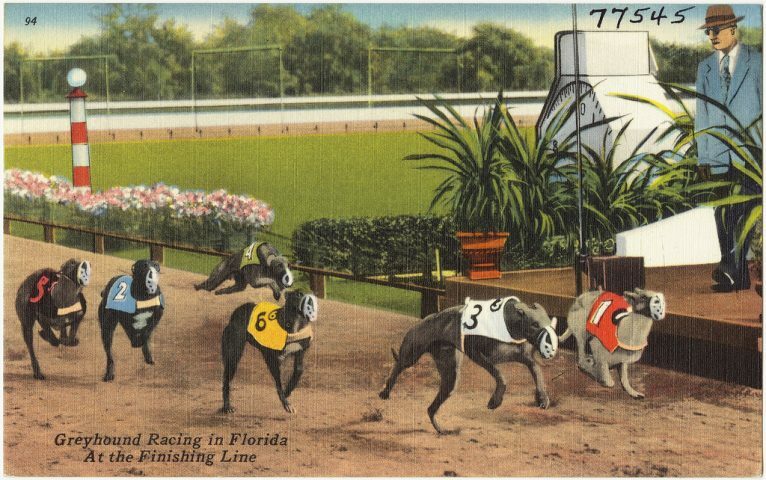 A postcard from the early 20th century depicting greyhound racing in Florida. Although the dust has settled after another tumultuous midterm election in Florida, the state and its citizens now face the integration of a slew of new constitutional amendments. Out of the 11 measures on the ballot which passed, Amendment 13 addressed the controversial sport of dog racing. The amendment prohibits pari-mutuel—a betting system where the winning bets take a share of a pool of bets—organizations from racing dogs and bans people in the state from wagering on live dog races. By January 2021, an industry in decline nationwide will lose its foothold in the Sunshine State. Some may see this as a victory for the advancement of animal rights. However, according to the National Greyhound Association (NGA), 13,000 Florida families will find themselves without employment and many greyhounds will be dislocated by the enforcement of the new amendment. The NGA expressed their disappointment concerning the passage of Amendment 13 in a brief statement sent out in an email blast and posted on their website. Written by Executive Director of the NGA Jim Gartland, the statement detailed the organization’s plans to ensure that the displaced greyhounds find a home or new track, presumably outside the state, along with their concern for the future of the thousands of Floridians who make a living through dog racing. In an email interview, Gartland further elaborated on the NGA’s grievances, claiming that dog racing had a significant impact on Florida’s economy. “It is projected that Florida could lose $600 million a year in taxes, let alone the dollars spent locally by kennels, owners and trainers and all other associated groups and employees as well as all of the charity money the tracks provided to local municipalities,” Gartland said. Gartland also advocated for the people who work in dog racing, saying that generations of families have relied on this industry to sustain themselves. The fates of the 11 tracks around the state also lie in limbo. Gartland noted that some of the facilities house cardrooms and other related gambling activities, so these operations may continue even after the dog racing has ceased. “The property may have some value but the specific construction of them would not be of much use other than what they were originally intended for,” Gartland said. Aside from sending greyhounds to adoption organizations, owners may choose to look for tracks elsewhere in the country to send their racers. Tracks in Alabama, Arkansas, Iowa, Texas and West Virginia remain as beacons of hope for this struggling sport and the NGA will help any owner transport dogs to tracks outside of Florida. Gartland assured that the NGA cares about the well-being of the dogs and that they find a home, wherever that may be. The Humane Society of the United States (HSUS) has offered and will continue to offer help in this transition to a new Florida, void of dog racing. Florida State Director for HSUS Kate MacFall echoed the non-profit’s commitment to cooperate with Florida tracks, should they want it. MacFall explained that the popularity of dog racing in Florida has declined over the past decade due to shared concerns about animal rights, decreased interest in animal entertainment and increased interest in alternate forms of gambling. “Floridians [know that they] can enjoy those other kinds of gambling without involving the gentle giants that greyhounds really are,” MacFall said. Breeding for dog racing has decreased in the last decade in tandem with the decrease in gambling on the sport. MacFall felt that breeders took preventative measures once they saw that Florida voters could pass an amendment to prohibit dog racing. MacFall has an optimistic outlook on the situation, despite the industry’s efforts to distance themselves from opponents to dog racing. Just over a mile away from New College, the Sarasota Kennel Club plans to continue like normal, with their “Championship Greyhound Racing” set to return this December. Their website shows no indication of their future intentions, but Sarasota residents can most likely expect local greyhounds in need of a home in the near future. 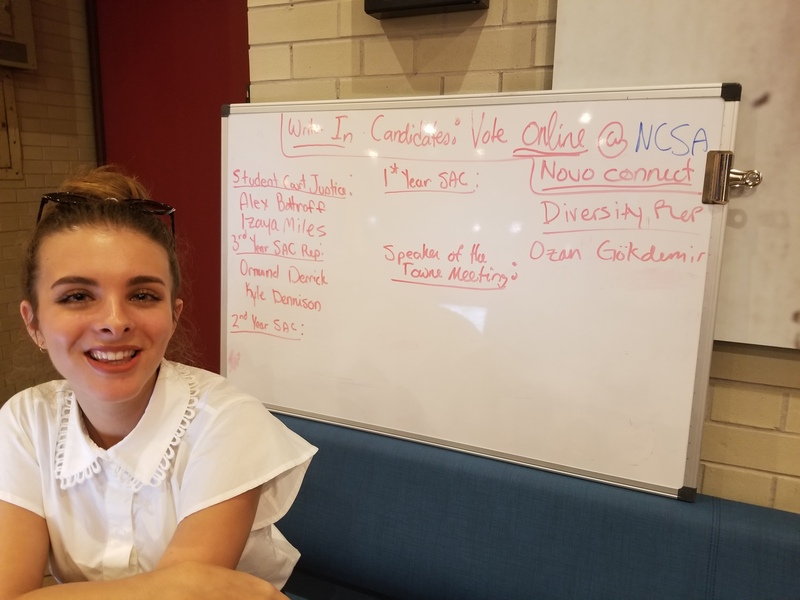 When contacted for an interview, the Humane Society of Sarasota County declined to comment and the Sarasota Kennel Club did not immediately respond to requests for comment. Information for this article was gathered from humanesociety.org, grey2kusa.org, wikipedia.org, sarasotakennelclub.com and ngagreyhounds.com.